Loudon Park National Cemetery, located roughly five miles west of downtown Baltimore, is one of the 14 national cemeteries established by the Federal Government during the Civil War. While Baltimore saw no major battles during the Civil War, the city was crucial to the Union military effort as a port and railroad hub. Most of the Civil War period interments at the cemetery are Union soldiers who died at military hospitals in the Baltimore area. The cemetery contains five monuments dedicated to Maryland Union forces erected by women’s groups and veterans’ organizations between 1884 and 1898. In 1912, the Commission for Marking Graves of Confederate Dead erected a monument commemorating Confederate soldiers who died as prisoners. Although Maryland remained in the Union during the Civil War, southern sympathies ran strong in Baltimore. Troops from northern states, traveling through Baltimore to defend Washington, D.C., often encountered hostility from the local population. Given Baltimore’s critical position as a railroad hub and seaport, the Union Army maintained a strong presence in the city to quell potential uprisings and sabotage. The national cemetery was officially established in late 1862, although interments of Union soldiers at the site began earlier in the year. The Federal Government initially leased one acre of the private Loudon Park Cemetery. It subsequently purchased the acre and other land in the vicinity to create the 5.24-acre national cemetery. The private Loudon Park Cemetery lies southwest of the national cemetery. In addition to the Union soldiers who died at the two military hospitals in Baltimore, the cemetery is also the final resting place for 35 Confederates who died while being held as prisoners of war at Fort McHenry at the entrance to Baltimore Harbor. In 1884, the cemetery saw the reinterment of approximately 200 African American Union veterans from government-owned soldiers’ lots in historically black Laurel Cemetery in northeast Baltimore. The Loudon Park National Cemetery is closed to new interments. A flagpole and the original 1870 superintendent’s lodge are located just inside the main entrance gate. With cemetery regulations requiring the construction of a lodge at national cemeteries, the two-story, brick Victorian residence is a departure from many other period lodges, particularly those designed by U.S. Army Quartermaster General Montgomery Meigs, whose lodges reflected the Second Empire style. 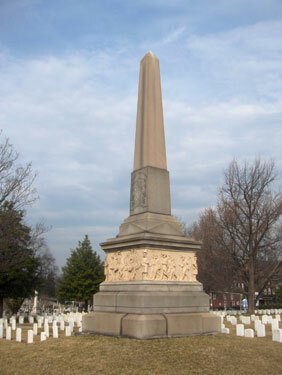 The Woman’s Relief Corps Auxiliary to the Grand Army of the Republic erected and dedicated the Unknown Dead Monument in 1895. Sculptor J. M. Dibuscher created a stately, recumbent figure in marble for this monument. Dedicated in 1896, the granite Loyal Sons of Maryland Naval Monument honors 4,162 men who took part in some of the most important naval battles of the Civil War. Standing nearly 25-feet tall, a statue of a sailor with a spyglass in his hand crowns the monument. Loudon Park National Cemetery is the final resting place for four recipients of the Medal of Honor, the nation's highest military decoration, given for "conspicuous gallantry and intrepidity at the risk of his life above and beyond the call of duty." Loudon Park National Cemetery is located at 3445 Frederick Ave. in Baltimore, MD. The cemetery is open for visitation daily between sunrise and sunset. No cemetery staff is present onsite. The administrative office is located at the Baltimore National Cemetery, and the offices are open Monday-Friday from 8:00am to 4:30pm; the offices are closed on all Federal holidays except for Memorial Day. For more information please contact the cemetery offices at 410-644-9696, or see the Department of Veterans Affairs website. While visiting, please be mindful that our national cemeteries are hallowed ground. Be respectful to all of our nation’s fallen soldiers and their families. Additional cemetery policies may be posted on site. 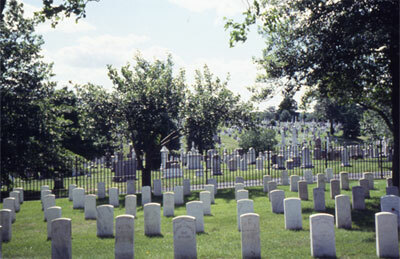 Loudon Park National Cemetery was photographed to the standards established by the National Park Service’s Historic American Landscapes Survey.